The Stadium was built in the 1920s and officially opened in October 1924. Over the years, Soldier Field was host to college football, boxing (the famous Dempsey-Tunney fight), the Chicago Bears, concerts, soccer and a host of other events broadcasted locally as well as internationally. Preservation of Soldier Field is important to history and to the City of Chicago. The physical appearance of the structure must be maintained and cannot be altered from its original state. Concare was called upon to aid in the preservation of the East and West Colonnades. These 10,000 square foot areas are open spaces for the general public to gather. However, the space had turned dangerous and the Chicago Park District closed the colonnades until a solution was developed and installed. Concare was given a clear goal: Create an aesthetically pleasing but safe surface that contributed to the preservation of the historic structure. Easier said than done. Grout lines had to be redone, then protected. The floor tiles in the Colonnades had been unprotected from weather and traffic. They had worn smooth, creating a very slippery environment with the slightest sign of moisture. In order to keep people safe, and to reopen these areas, the solution had to be slip resistant. 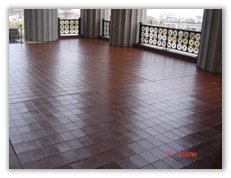 The Colonnade floors are a nonporous red brick quarry tile. Underneath the tiles is a setting bed, a layer of cement and sand that had begun to deteriorate. During our investigation, Concare found the layer was absorbing and holding moisture, further deteriorating the structure. Water had to be kept from penetrating the surface. A contractor with expertise in tile setting was brought in by the owner to repair sections of the floor. Cracked tiles were replaced; missing grout replaced and loose tiles were eliminated. This repair work established a consistent surface condition on which to build our solution. 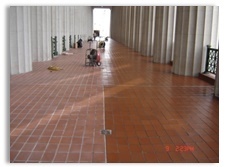 Because Soldier Field is a historical site, utilizing part of the floor for on-site testing was not even an option. In order for Concare to test potential applications, we obtained sample tiles that were transported to our shop for testing. In analyzing the tiles, we immediately found challenges: the tiles were not easy to bond to and some of the methods of preparation would damage the tiles. Concare worked closely with a local supplier in order to formulate options to protect the floor. A methylmethacrylate technology was selected which met expectations on the test tiles. We presented the samples and received approval for our recommendations. We were ready to begin the project. Scheduling the project was a challenge. Concare project management separated it into two phases each would take approximately one week to complete. With 16 workers on-site, Concare completed phase one of the installation on-time. A few short weeks later, the product installation began to fail. The product was not adhering to the tiles and the application was disbonding in areas. Concare consulted with the local supplier as a solution needed to be found, and fast. Another challenge then erupted for Concare; the local supplier walked away from the failure leaving Concare to solve it on their own. Concare decided to put a stop to the project temporarily. Concare challenged its key suppliers to find a better answer, and in the end, BASF, a multi-national chemical supplier, was the only company capable of solving the bonding issue which allowed Concare to get the project back on track. BASF worked with us to find product system modifications that worked. Concare was now ready to begin removal and install the new BASF products. Concare needed to formulate a way to remove the first application without damaging the tile and grout. Shotblasting or any kind of impact method was out of the question. The team at Concare developed a non-impact method that consisted of specially modified rounded diamond blades mounted on Diamatic grinders. Because the tiles were not perfectly flat, Concare workers had to remove remnants of the failed product in the grout and on the edges of the tiles by hand. Quality testing was completed prior to and throughout the project monitoring the moisture content, temperature, application and mixing of product components. Rapid rH probes and calcium chloride tests, plus Elcometer adhesion testing, was performed to be sure the most optimum conditions were present before the products were applied. Concare designed a comprehensive process that was flexible. Because the company has the talent and experience to handle difficult applications, Concare was able to step back, make modifications and move forward with minimal disruption to the operation. The result of the efforts protected the historical site from further deterioration and gave the general public the ability to experience history for themselves.